What did that the leaders leader say? Here’s where to find out. Read our transcript of the Munk Debate, Sept. 28 at Roy Thompson Hall in Toronto moderated by Rudyard Griffiths. We’ll keep adding through the evening. Rudyard Griffiths: Mesdames et messieurs, bonsoir. 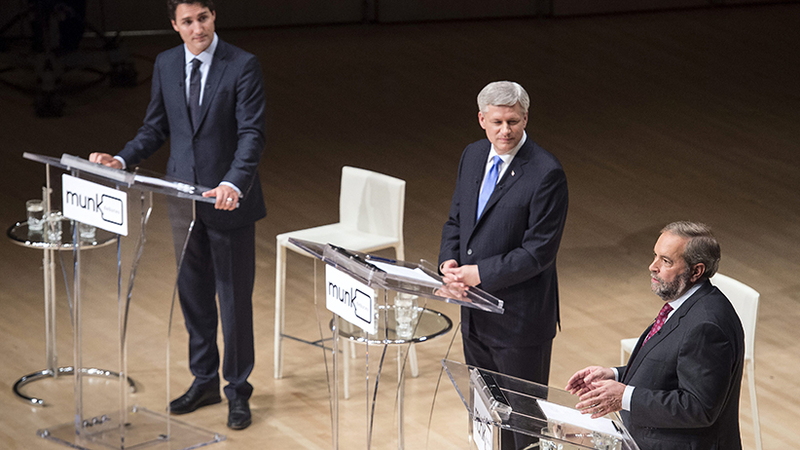 And welcome to the Munk debate on Canada’s foreign policy. Je m’appelle Rudyard Griffiths. Je suis le directeur général de la Fondation Aurea and Chair of the Munk Debates. It’s my privilege to have the opportunity to host tonight’s historic proceedings, the first ever federal election debate devoted exclusively to foreign policy issues. Tout d’abord, j’aimerais souhaiter la bienvenue à notre vaste auditoire. First, the national television audience tuning in to this debate in French and English nationwide on CPAC and CHCH Television and across North America on Syrius XM and C-SPAN. Also, a warm hello, bonsoir, to our online audience watching this debate right now in French and English on munkdebates.com and on the website of our official media partners, Facebook Canada and The Globe and Mail. And finally, hello to you, the over 3,000 members of the Munk Debates who’ve filled Roy Thompson Hall to capacity for this special Munk Election Debate. Our ability tonight to host this debate for Canadians from coast to coast to coast would not be possible without your support and the generosity of the Aurea Foundation. So commençons. Let’s get our debaters out here and our debate underway. Mesdames et messieurs, j’ai le plaisir de recevoir M. Thomas Mulcair, chef du Nouveau parti démocratique du Canada. (Mr. Thomas Mulcair. Next up is Mr. Stephen Harper, the Leader of the Conservative Party of Canada. M. Harper pour le Parti conservateur du Canada. And finally, bienvenue à M. Justin Trudeau, chef du Parti libéral du Canada. Well, gentlemen, we are glad to finally have the three of you here on stage. You’ve all agreed to the rules of this debate in advance, and I want to quote as a friendly reminder the rule that leaders will respect each other’s right to speak in order to make points uninterrupted. So let’s get started. Right now, the world is witnessing the largest humanitarian crisis since the Second World War as the conflict in Syria and Northern Iraq rages on. Mr. Mulcair, you’ve pledged as Prime Minister to pull Canada’s military forces out of the international coalition fighting ISIS. The question for you is if the threat the Islamic State represents doesn’t justify a military response, when would an NDP government use military force? Vous avez vingt-dix (sic) secondes. Allons-y. Hon. Thomas Mulcair: Canada does have a role to play in fighting the horror that is ISIS. We can help stop the flow of arms, help stop the flow of funds and of course help stop the flow of foreign fighters. There are more than 60 countries involved in the coalition. Canada would remain a member with us, but only 12 are involved in a combat mission. Pour moi, c’est important de se rappeler qu’ici ce soir on est sur la même scène, dans la même salle où on a dit notre dernier au revoir à Jack Layton. Moi, je veux continuer le travail de Jack et prôner les mêmes valeurs québécoises et canadiennes, des valeurs de paix, de démocratie, des valeurs de solidarité, développement économique durable. Moi, je pense que la question est de savoir quel Canada on veut projeter sur la scène mondiale. Est-ce que ça va être un Canada fermé, guerrier, pollueur ou ça va être un Canada ouvert sur le monde qui respecte nos valeurs? We all know that there are a certain number of things that a prime minister has to get right. This election is about change, and there’s no area where Canadians want change more than in that of our foreign affairs. A prime minister has to maintain a good relation with the U.S. Mr. Harper’s lost the respect of the White House. We have to make sure that we have a place on the world stage. We missed our turn on the Security Council. We have to take care of the defining issue of the age, which is climate change. We’re the only country to have withdrawn from the Kyoto Protocol. I’ll defend your values, Canadian values on the world stage. Where Mr. Harper’s failed, we’ll get it done. Rudyard Griffiths: Let’s now bring Mr. Harper into the debate for a seven-minute one-on-one with Mr. Mulcair on the topic of intervention. M. Harper, quelle est votre opinion sur le sujet? Le très hon. Stephen Harper: Notre réponse à cette crise en Syrie et dans la région est une réponse généreuse, équilibrée, l’aide des réfugiés, l’aide humanitaire et aussi notre participation dans la mission militaire contre le soi-disant État islamique. We have a balanced approach. We’re giving a generous but responsible refugee policy. We’re bringing additional humanitarian aid to the region, and we’re also obviously participating in the international military effort against ISIS. Why are we doing that? Not simply because ISIS threatens to slaughter, literally, hundreds of thousands, create millions of additional refugees, but this is an organization that it wants to use parts of Syria and Iraq as an international base for terrorist operations, not just in the region, but also against this country. That’s why we’re there with our allies, and that’s why there is broad international support for this intervention that is necessary not just for the region, but to protect our own security interests. Hon. Thomas Mulcair: Well, it’s important to remember that this is not a NATO mission. This is not a United Nations mission. And Rudyard, to get back to your initial question, of course when it was a question of going into Libya under the United Nations’ Duty to Protect, the NDP voted for those air strikes because it was a UN mission. When that started to morph into something completely different, we withdrew our support. So the answer to your question is we understand that there will be times when we have to, either under the NATO Charter or under our international obligations with the UN, to use force, and we won’t shy away from that. But the real question here is that the only thing that we can do? Now Mr. Harper always takes the same approach. And you know, when your only tool is a hammer, all problems resemble nails, but this is a complex situation. It’s one that has deep roots and many years of divisive conflict in the region, and there is one area where Canada is completely failing, and that is in dealing with the refugee crisis. My own family, the Irish side of it at the least, came over during the Potato Famines of the 1840s, and you what? In Quebec City, people went down to the docks, even though a lot of them were getting sick, and took in the most miserable in the world. That’s Canada. That’s who we are. Catherine’s family, the Sephardic Jews who were expelled from Spain, they were taken in the Muslim countries that are today Turkey and was then the Ottoman Empire. That’s the opening world that we can always aspire to. Two million refugees living in our NATO ally Turkey. We’re not doing enough to help. There are requests from the United Nations to take in 10,000 by Christmas. Mr. Harper is not even going to get near that number. They want 46,000 between now and 2019. The NDP government will get it done. Rt. Hon. Stephen Harper: If I could just maybe correct a couple of facts here, first of all, none of our NATO allies — not all of them are involved in the coalition — but none of them are opposed to it. They’re all supportive of our mission against the Islamic state. The United Nations is not opposed. In fact, this intervention is happening at the invitation of the Government of Iraq under international law. In terms of refugees, Canada’s response has been generous and responsible. We’ve admitted so far 15 percent of all the world refugees from the region. In terms of our response to this recent crisis, even before it was in the headlines, I announced our intention to accept additional refugees. I’ve since announced a number of changes to our system to expedite that number. And we’re doing so while at the same time making sure that we choose the refugees, that we choose those who are genuine refugees, the most vulnerable people and also maintain all standards of security and other screening. This is a generous and responsible approach that Canada is taking. Rudyard Griffiths: Gentlemen, I just – I want to step in here just to refocus the discussion. We’re going to have ample opportunity to talk about the refugee crisis later in this debate. Mr. Mulcair, just follow up more precisely on where an NDP government would intervene and why. What are the criteria that you’re looking for? Hon. Thomas Mulcair: Sure. I mean it’s happened, you know, because we do talk, believe it or not. The Prime Minister consulted me when France was looking for heavy airlift capacity in a crisis in Mali. I agreed spontaneously. That’s the type of thing that Canada could. I gave you the Libyan example. But with regard to ISIS, there are things that we can be doing. Canada is one of the only countries in the world and it is the only NATO country not to have signed the Arms Trade Treaty. Now we find ourselves in some particularly curious company here with countries like Saudi Arabia, Iran, North Korea, Belarus. And those are not the types of countries we normally identify with, but they’re countries like Canada that have refused to sign that treaty. That treaty, when in force, can help stop the flow of arms to ISIS. We can get a lot more serious, as the United Nations Security Council has asked in successive resolutions — 2170 and 2199 both speak very specifically to stopping the flow of money. We can be involved in that. And on the flow of foreign fighters, never forget that in Mr. Harper’s failed Bill C-51, which was backed by Mr. Trudeau’s Liberals, there was nothing on deradicalization here at home. The NDP has a clear plan to bring in 2,500 more police officers across the country. We know that we have to work with faith groups of all descriptions, but you know, Mr. Harper always has one group in mind, and he tends to finger-point and objectify one particular group. He doesn’t talk about houses of worship; he specifically refers to mosques. And Muslims across Canada know how to interpret that for exactly what it is. Rudyard Griffiths: I want to bring the Prime Minister in again. Rt. Hon. Stephen Harper: Look, let’s be clear that the Government of Canada is pursuing all levels of response to this particular problem, not just refugees and humanitarian aid that I mentioned earlier. We’re pursuing radical – anti-radicalization efforts in Canada in terms of financing of terrorist organizations. We’re involved with a range of coalition partners — the World Bank, the G-20 — working on all of those issues, but none of that explains why the other parties think we should also not take direct military action with our key allies against the Islamic State. This is a group that not only left to its own devices would slaughter literally millions of people in its wake, but has an intention, a stated intention to attack – to launch terrorist attacks around the world, including against this country and has indicated that it has the capacity to engineer and inspire such attacks. We see that all around the world. There’s no – we have a very clear reason for being there, supported widely by our allies in the international community. Why we would abandon this mission is a question that goes begging. We have to be able to do all of these things: humanitarian support, stop the flow of foreign fighters and funds and also take on ISIS directly in the region, so we keep pressure on that organization so it cannot be using that as a base for terrorist operations. Rudyard Griffiths: M. Trudeau, à vous la parole. Justin Trudeau: Merci beaucoup. D’abord, on est tous d’accord sur – sur cette estrade que l’engagement au Moyen-Orient va être un engagement long terme. There are no quick fixes or easy solutions to the situation in northern Iraq and Syria. And what we have here is three different perspectives on what we need to actually do. Mr. Mulcair has said he doesn’t think we should be in this fight at all. Mr. Harper hasn’t seen a fight in the Middle East that he hasn’t wanted to send Canadian troops into, starting with 2003 in George W. Bush’s Iraq War. The Liberal Party, as we have in the past, know that Canada has an important role to play on the world stage and should be a strong partner in this coalition, but we disagree with Mr. Harper about the best way to do it in terms of dropping bombs. We think that Canada, as we did very successfully in Afghanistan for many years, as we’ve done in many places around the globe, should be training up the local forces, so they can defeat ISIS on the ground because we know that sending in western troops isn’t always the best possible outcome, and indeed, often makes things worse. We need to ensure that we’re equipping local people to be able to bring that right to ISIS, and Canada has a strong and real capacity to do that. And that actually ties to something that President Obama was talking about today, which is a call to once again re-engage and revitalize United Nations peacekeeping. The fact that Canada has nothing to contribute to that conversation today is disappointing because this is something that a Canadian Prime Minister started, and right now there is a need to revitalize and refocus and support peacekeeping operations across the country – around the world. Rudyard Griffiths: Mr. Trudeau, un instant. I’d like to bring Mr. Mulcair back in. Hon. Thomas Mulcair: Well, as Sergeant Doiron’s tragic death on the front lines reminded us, this is not just a training mission. Canadian Special Forces have been painting the targets for our air strikes. We know that. They’ve been involved in live fire on the frontline. We know that. The NDP’s taken a clear position on this since day one. We’ve said that we should not be involved in the combat mission. We have said that there are several things that Canada can and should be doing. There are more than 60 countries involved in this effort; only 12 of them are involved in the combat mission. And that’s why we think that we should be stopping the flow of arms, stopping the flow of funds, stopping the flow of foreign fighters. But no, we don’t think that our proper place is in that combat mission. Rt. Hon. Stephen Harper: Let’s be clear: Canada’s still involved in peacekeeping in areas like the Sinai. We still contribute peacekeepers around the world. Obviously, there is not a peacekeeping mission to be had right now in Iraq and Syria. And we’re not just involved in an aerial campaign, as has rightly been observed; we’re also involved in fact in training troops. In northern Iraq, we are working with Peshmerga forces who have been an effective fighting force, protecting themselves and other minorities against the onslaught of ISIS. I visited them there, and we’re extremely proud of the work that they are doing. But the reason we’re also involved in the area campaign is through much of Iraq and Syria there is in fact no ground resistance to ISIS. And the only way to keep them back, to hold them back, keep them in their positions and keep them from simply being able to sit back and plan attacks against us is to keep the military pressure on them. That’s why President Obama and our other allies are involved in an aerial campaign. Justin Trudeau: The challenge Canada faces in any time we engage the world is to support our national interests in a constructive and positive way, and there’s no question that it’s absolutely in our national interest to help defeat ISIS, to work with international partners on that. But how Canada can best help is by doing more of the kind of training of infantry troops on the ground that we developed tremendous capacities to do in Afghanistan and in other places. That is something that Canada has an advantage and an ability to do on top of the necessary humanitarian and much more refugee support that I know we’ll talk about later. But that kind of engagement around the world where Canada is focussed on the things that we can do differently and often better than anyone else is what we have to get back to. Rudyard Griffiths: Mr. Trudeau, since Mr. Mulcair had the first word, we’re going to give him the last in this section. Hon. Thomas Mulcair: President Putin’s statements today are cause for concern for all of us. This is a cauldron. This is a time also for Canadian values to be projected into that situation, our strong desire for peace. Mr. Harper just talked about peacekeeping. The last time the Liberals were in power we went from number one in peacekeeping in the world to number 32. And under Mr. Harper, we’re now at number 68. We know that Canadians want us to do a lot better, and we will. Rudyard Griffiths: Gentlemen, I want to thank you for a civil and substantive debate in this first topic. We’re now going to move on to our second item to discuss tonight, the refugee crisis. Needless to say, Canadians have been deeply moved during this election by the crisis, the devastating toll that it’s having on women, children and families. Mr. Harper, the question is to you. Can you please explain to Canadians how your latest change in policy reflects an adequate response given the enormity of this crisis? Allez-y. Vous avez 90 secondes pour répondre. Le très hon. Stephen Harper: Merci beaucoup. J’ai déjà expliqué que nous avons une approche généreuse et équilibrée. Plus de réfugiés, plus de l’aide humanitaire et on continue la mission militaire contre le soi-disant État islamique. In terms of the refugee situation, I’ll just outline once again what the government has done. Even before this was in the headlines, we’d announced our intention to accept an additional 10,000 refugees. That’s on top of additional numbers that were already coming and on top of the fact we already have resettled 15 percent of all the refugees from the region in the international community. We’ve since announced our intention and in fact have implemented changes to expedite the process so we can move those additional numbers in much more quickly, and we’ve been doing so in a way to make sure we pick the most representative, the most vulnerable groups, genuine refugees and that we maintain all standards of security screening. This is a responsible approach. It’s certainly in line with what most other countries are now doing. In addition to that, we’ve also announced during this campaign the establishment of additional funds for humanitarian assistance. Canada is one of the largest providers in absolute dollars of humanitarian assistance in the region — $800 million directly to the region, over a billion dollars to the wider region. We’ve announced an additional fund. I know Canadians have responded with a need – with a desire to respond generously, and we encourage Canadians to contribute to that fund. We will match contributions, let us remember regardless of what the response is, to refugees. The vast number of people will remain in the region and will continue to need our help for the foreseeable future. Rudyard Griffiths: M. Trudeau, entrez dans la discussion, s’il-vous-plaît. Justin Trudeau: D’abord il faut comprendre l’échelle du désastre humanitaire qui existe à travers la planète. Il y a 60 millions de personnes déplacées, de réfugiés et nous devons, en tant que pays qui a toujours aussi bénéficié d’attirer ces gens-là ici au Canada et de faire croître notre économie et nos communautés d’une façon positive, nous devions faire notre part. Plus que ça, nous devons savoir que dans les décennies à venir, il va y avoir encore plus de réfugiés à cause des changements climatiques, à cause d’autres conflits. Nous nous devons de prendre une place de leadership dans les instances multilatérales pour démontrer comment la planète entière peut répondre aux enjeux des réfugiés parce que nous avons, par exemple, un engagement que nous prenons à trois niveaux. D’abord, il faut faire plus ici au Canada pour accueillir des gens. Nous, on avait proposé 25 000 Syriens il y a même six mois et on continue de dire que c’est ça qu’on devrait faire pour le début. Depuis des années, je vois M. Harper à la Chambre des communes dire oui, on va faire plus de choses et n’atteindre pas ses cibles. Deuxièmement, nous devons travailler avec la communauté internationale, avec les pays en proximité que ce soit le Liban, que ce soit la Turquie, que ce soit la Jordanie qui sont en crise à cause des réfugiés syriens pour les aider mais aussi aider les pays d’Europe de s’adapter à cette vague d’immigrants. Mais nous nous devons aussi de travailler dans les pays d’origine où on peut. Évidemment en Syrie il faut arrêter la guerre. D’abord, on a d’autre travail à faire. Rudyard Griffiths: Un instant. Laissez M. Harper répondre. Le très hon. Stephen Harper: Pendant les décennies passées, le Canada a admis un quart de million de réfugiés — par capita, le plus grand programme de rétablissement des réfugiés de la planète. Dans cette situation, selon les chiffres que j’ai, il y a 15 millions de personnes réfugiées déplacées, peut-être un plus grand nombre dans la grande région. Évidemment, il n’y a pas une solution juste par la politique de réfugiés. C’est la raison pour laquelle nous avons une approche équilibrée avec beaucoup de l’aide humanitaire. La grande majorité qui reste là et aussi des actions militaires contre le soi-disant État islamique qui sont déterminés de créer plus de réfugiés et littéralement du meurtre des millions de personnes. On doit faire ces trois choses. Justin Trudeau : Les gens sont unanimes à travers le – quasiment unanimes à travers le pays. On se doit d’en faire plus. Le Canada a toujours bénéficié d’avoir été un pays ouvert qui admet des gens en situation de crise, que ce soit les Ukrainiens au début du siècle, que ce fut les Hongrois qui fuyaient de derrière le Rideau soviétique, que ce soit au niveau des Vietnamiens ou des Ismailis qui fuyaient pour venir au Canada, on a accepté des dizaines de milliers de personnes, et M. Harper aime parler de la sécurité. Mais la sécurité a toujours été une préoccupation et on a toujours su s’en occuper, même dans des situations extrêmes et avec moins de ressources que ce qu’on a aujourd’hui. Alors cette idée qu’on doit en faire plus, les gens sont en train de le dire, les Premiers ministres sont en train d’en parler à travers le pays, les maires de municipalités veulent en faire plus et ce gouvernement traîne de la patte pour ne pas en faire plus. Et vraiment, quand on regarde des gens comme Rick Hillier en train de dire on peut en faire 50 000 avant Noël, il faut savoir que c’est des voix crédibles qui disent que le Canada se doit d’être encore une fois ce pays que nous avions toujours été. Justin Trudeau: (Diaphonie) d’annonces ce n’est pas d’action, M. Harper. Le très hon. Stephen Harper: — processus plus vite qui a déjà commencé. The reality is that Canadians expect us to act in a way that is generous and also responsible. We haven’t opened the floodgates. Some European countries just started letting everybody in, and now they’re trying to reverse those policies. I’ve asked our officials what can we do to speed up the process, how can we – what kind of numbers can we get in and how quickly while maintaining our security and not literally spending tens of millions of additional dollars. And these are the numbers we’ve arrived at. We’re not chasing headlines. We’ve arrived at it through consulting officials and through proceeding on a program that is, by all standards, generous. You know, we’ve said 10,000 more. The United States has said 10,000 more. It’s a country 10 times larger than us. I think we’re responding in a way that is responsible and also generous and that’s the responsibility of the government of Canada, not to chase headlines. It’s to make sure we act in a way that we can actually fulfill. Justin Trudeau: Mr. Harper, we stand here tonight just a few blocks from Ireland Park. Ireland Park was where, in 1847, 38,000 Irish men, women and children, fleeing the famine, arrived on the shore of Toronto. They were 20,000 citizens of Toronto at that time and they accepted 38,000 refugees who proceeded to build and contribute to this country, to this city and to who we are today. Canada has always done more. It’s not about politics. It’s about being the country that we have always been. C’est à ce niveau-là que vous êtes en train de ne pas seulement échouer à notre devoir en tant que Canadiens mais le monde entier est en train de nous regarder pour dire qu’est-ce qui se passe avec le Canada. Vous étiez jadis un pays qui recueillait les gens, qui aidait, qui savait que cette diversité que nous aimons des gens en crise, en détresse qui ne veulent que bâtir un meilleur avenir pour leurs enfants et leur communauté. On leur donne cette opportunité-là. C’est ça qu’on a toujours été comme pays et maintenant M. Harper est en train de dire sécurité, il faut faire le minimum nécessaire. Bien non, ce n’est pas ça parce qu’en plus M. Harper qui parle de résister contre les tyrans et les dictateurs, mais vous savez qui résiste contre les tyrans et les dictateurs M. Harper? Les familles qui fuient pour leur vie qui ont résisté contre la violence locale, qui viennent au Canada. Qu’est-ce qu’ils vont faire une fois qu’ils arrivent au Canada? Vous leur enlevez leurs soins de santé M. Harper. Ce n’est pas ça le pays généreux qu’on a toujours été. Le très hon. Stephen Harper: On a déjà admis 23 000 personnes de la région. We’ve already admitted 23,000. We’ve had a commitment to an additional 10,000 and on top of that, during this campaign, an additional 10,000 that we sped up the process on. We’re not living in a different era here. We’re living in an era where people are fleeing a terrorist war zone, and we obviously must have security screening. In terms of the policy on health support for refugees, let’s be very clear here. We have health support of our refugees and immigrants. Where we stopped those benefits is when we have cases of refugee claims that have been turned down, rejected because they were bogus. In those cases we do not provide health care better than the average Canadian gets. That’s the responsible thing to do. Hon. Thomas Mulcair: Merci beaucoup, Rudyard. It’s important for Canadians to remember when we’ve gotten it wrong in the past and why we have to learn from those experiences. The Komagata Maru was pushed back from Vancouver. A lot of those people were killed when they made it back home. They weren’t allowed into Canada. Far more recently, a boat called the Sun Sea arrived also in B.C. Minister Vic Toews, one of Mr. Harper’s Ministers, said they were terrorists. A great number of them have already been admitted as legitimate refugees. Tout dépend de notre approche — si on est ouvert, si on veut vraiment aider les plus démunis de la terre ou si on veut trouver des prétextes pour ne pas agir. L’ancien chef de l’état-major, Rick Hillier, a sommé le Premier ministre qu’il a servi d’arrêter d’utiliser à mauvais escient le prétexte de la sécurité pour refuser d’aider les réfugiés. Moi, je pense qu’il faut écouter Rick Hillier. Son expérience, sa voix est raisonnable et ça reflète les valeurs profondes que ressentent tous les Canadiens qui voient cette crise se dérouler. Je veux ajouter une dernière petite chose, avec votre indulgence Rudyard. Je vais me permettre de rappeler qu’il y a un vrai hiver sur la frontière entre Syrie, Iraq et la Turquie. L’hiver dernier, il y a des enfants qui sont morts de froid. Je n’admets tout simplement pas qu’un enfant puisse mourir de froid, surtout quand dans un pays comme le Canada c’est une chose qu’on ne connaissait pas. On peut bien les aider un petit peu plus. Faisons plus, M. Harper. Il n’y a plus de prétextes possibles. Le très hon. Stephen Harper: M. Mulcair, on a déjà annoncé plus. On a déjà annoncé un système plus vite. We’ve already announced more, already are doing more, but this isn’t just a game of trying to up the numbers. We have to do things responsibly. I have visited refugee camps in Jordan of Syrian refugees. I have visited refugees in Northern Iraq. I have visited with families we have accepted from these regions. I have met with leaders from those communities, not just in Canada, but from the region itself, and I can certainly tell you from my visits to the refugee camps in Jordan and debriefings there, we cannot pretend there are no security risks. It is important that we do screening, and those countries in the world that responded to these headlines, as these others would have, by just opening the doors and doing no checking have rapidly regretted that and are now trying to put in place the very kind of system that Canada has been pursuing all along. It’s a generous response. It’s a responsible response. It is not based on the headlines. It is based on the right thing to do. Justin Trudeau: M. Harper, ce qui manque clairement dans cet enjeu-là c’est tout simplement une question de volonté politique. Quand Joe Clark, Premier ministre, a décidé d’accepter des dizaines de milliers de Vietnamiens qui venaient au Canada qui fuyaient les communistes, qui fuyaient une guerre atroce, oui, ils étaient préoccupés de la sécurité, mais la volonté politique de dire nous devons faire plus, nous pouvons faire plus, a contribué pas seulement à la sécurité de bien de gens et la sécurité économique de bien de gens qui sont venus ici mais ça a contribué énormément au Canada. Mon père, en ‘72, quand il a accepté les Ismailis venus de l’Ouganda qui quittaient un dictateur affreux, a eu beaucoup, beaucoup de misère à convaincre les Canadiens qu’il fallait accepter ces réfugiés islamiques de l’Afrique, mais les Canadiens ont compris rapidement par le succès extraordinaire de cette communauté-là, qui a contribué à l’essor de nos villes, à l’essor de notre pays, que d’amener des gens ici pour leur donner une chance de réussir c’est l’histoire même du Canada. C’est ce qu’on a toujours fait. Justin Trudeau: — diversité c’est une sorte de force. Rudyard Griffiths: I want to bring Mr. Mulcair back in for our remaining time. L’hon. Tom Mulcair: C’est extrêmement difficile d’entendre le Premier ministre d’un pays qui a jadis été reconnu comme un des premiers au monde en termes d’aide aux réfugiés et aux plus démunis de la terre dire que tout ça se résume pour lui à une question que les autres sont en train de chercher avoir les titres de journaux. I don’t accept to hear a Prime Minister of Canada to say that trying to help the most needy of the Earth, help people fleeing a tragedy on a scale not seen since the Second World War, anybody fighting to take more of them into Canada and to help them is somehow chasing headlines. I find that’s disrespectful, but not only for the people on this stage because I think that every one of us wants to ensure security. It’s disrespectful to Canadians and to Canadian values. Rudyard Griffiths: Merci, M. Mulcair. Le temps est écoulé. I’ll go on to our next topic now. It’s the global terrorist threat. We all know that it’s taken on new urgency with the large scale recruitment of foreign fighters. In response, Canada’s Parliament passed new antiterrorism legislation that critics have attacked as undermining civil liberties and for its lack of democratic oversight. Expliquez-nous, M. Trudeau, as a self-professed champion of individual freedoms, why did you vote for Bill C-51? Justin Trudeau: Canadians expect their government to do two things: protect our security and defend our rights and freedoms. That’s what the Liberal Party has always stood for. It’s what we did successfully in the years following the 9/11 attack. We brought forward responsible legislation that went through many amendments and many tweaks before we got that balance right, but we did get that balance right. Canadians expect their governments to do that in a way that doesn’t foment fears or play up divisions. Now, Mr. Mulcair has had three different positions on C-51. His initial position was to change it. Then a few weeks later, it was to repeal parts of it. And then now, it’s to scrap it entirely. And the one thing he says is that we don’t need to do anything more to protect our security than we have right now, because he hasn’t put any options forward. Mr. Harper doesn’t think we need to do anything more to protect our rights and freedoms, whereas in a free society, we know that we have to ensure that any time we give greater powers to our police, our investigative, our national security services, we are matching that with an increase of our protections. That’s why the Liberal Party pushed for strong amendments during the committee process on C-51 and that’s why we’re committed to bringing in Parliament, oversight by parliamentarians, like our other Five Eyes allies, and sunset and review clauses that are going to meet what Canadians asked for, which is defend our rights and protect our safety. Rudyard Griffiths: M. Mulcair, allez-y, entre dans la discussion avec M. Trudeau. Hon. Thomas Mulcair: When you have convictions, you have to have the courage of those convictions. The NDP took a very strong principled stand against C-51. We looked at it, we knew it was wrong. The same way the NDP was the only party to stand up in 1970 when Pierre Trudeau put hundreds of Canadians in jail without trial, without even any accusation. The only party to stand up against that was Tommy Douglas’s NDP. That’s the courage of your convictions. When we started our fight against C-51, the vast majority of Canadians were in favour of it. Mr. Harper had done an excellent selling job. By the time it had finished in committee, Canadians understood two things: that it was more to do with the politics of fear and division than anything to do with security; and every single group that came and testified, every expert who came in there and four former Prime Ministers, including three Liberal Prime Ministers, all said it was wrong. The NDP stood up against C-51. Justin Trudeau: Now I’ll – I’ll – I’ll get to C-51 in a moment, but throughout this campaign, in direct references and in indirect references, both of these gentlemen have at various points attacked my father. Let me say very clearly I am incredibly proud to be Pierre Elliott Trudeau’s son, and I am incredibly lucky (applause) to have been raised with those values. Hon. Thomas Mulcair: What we are talking about is Canadian values, the values that guide us when we make our choices. Sorry to hear that Mr. Trudeau thinks that we’re talking about his father in a negative way. I’m talking about historical fact, that the only party that stood up in 1970 and defended Canadians’ rights and freedoms was the NDP. The only party that stood on a question of principle against Bill C-51 was the NDP. Mr. Trudeau went to the University of British Columbia and said that he was against it, but that he was afraid of Stephen Harper making political hay. Hon. Thomas Mulcair: That’s not political courage. Hon. Thomas Mulcair: Sorry, you said we were going to be able to speak individually. I don’t mind (laughter) being able to finish my sentence. Hon. Thomas Mulcair: On Mr. Trudeau’s other complaint, which he throws out there very lightly at every occasion, Radio-Canada did a check of Mr. Trudeau’s complaint, that somehow he has cases where I’ve said one thing in French, one in English. You know what they said? That it was total malarkey. It’s not true. Justin Trudeau: Mr. Mulcair, Mr. Mulcair, it’s very clear, we saw it again earlier this week, or last week. In the French debate, you were happy to talk about your decision to – and make it so that separatists could break up this country on a single vote, even though the – the Supreme Court of Canada said no, unanis-, unanimously, but you won’t talk about it with Peter Mansbridge in English, you wouldn’t talk about it at the Maclean’s debate. The fact is you carry two different discussions at the same time, and that is not responsible. Now – fortunately, the podiums are transparent. Mr. Har-, Mr. Mulcair is playing a similar politics of fear, trying to say that because of C-51, with which we have been very clear that we have reservations, but there are elements in that bill that protect Canadian security immediately, and we’re committed to bringing in the changes necessary to get that balance right. But Mr. Mulcair is also playing the politics of fear and division, fear for environmental groups and First Nations, fear that we’re suddenly in a police state, fear that we’ve suddenly ripped up the Charter of Rights and Freedoms. Justin Trudeau: Mr. Mulcair – Mr. Mulcair– Mr. Mulcair, in committee, there was a concern that people had around lawful protests and it is a concern that we had, and we heard many committee members point out the fact that this was something that needed to get changed. The Liberal Party put forward amendments. They were voted down. The Conservative Party put forward the same amendments and passed it. Justin Trudeau: –– and defend our rights. Rudyard Griffiths: –– moments of this segment. I want to give the last word to Mr. Mulcair. Hon. Thomas Mulcair: First of all, that is completely false. I have never, ever used the term police state. With regard to our stance, I have confidence in Quebecers that the normal rules of a democracy apply there, and that’s what I said to Peter Mansbridge. Et c’est précisément ce que j’ai dit au débat français la semaine dernière. Moi, je fais confiance aux Québécois de respecter les règles normales dans une démocratie. M. Trudeau ne le respecte pas. Rudyard Griffiths: Thank you. Now, I’d like to hear Mr. Harper on this topic. Thank you. Rt. Hon. Stephen Harper: This government is – this government is fully committed to protecting both our freedoms and our security, both of which are under attack from the group ISIS. The threat we face today is not CSIS, it is ISIS. And if we look at, (laughter) – and if we look at (applause) the provisions, the provisions of the bill that Mr. Trudeau actually well defended, give our security agencies pottern-, powers that are similar across the western world. For example, the ability of security agencies to share information on security threats, to intervene directly through a warrant if there’s a need to, if there’s a plot actually unfolding, the ability to take down websites that attempt to recruit people to terrorist organizations in Canada. These are all important matters overseen robustly by an independent organization headed by a retired judge. Justin Trudeau: First of all, first of all, Mr. Harper talks about oversight of our security agencies. He put Arthur Porter, who died in a Panamanian prison fighting extradition to Canada, in charge of overseeing our security agencies. (Laughter.) What our other Five Eyes allies do is ask elected parliamentarians to oversee the work of our national security agencies and police agencies. Canada is the only one of those allies who does not – allies who does not do that. And it’s al-, it is about two things. It is about ensuring that, yes, those police powers aren’t overused and abused, that we’re making sure that – that we are upholding the Charter rights of every individual. But at the same time, it’s also about holding our national security agencies and police to account, to make sure that they are actually protecting us in every possible way. And we need to trust elected parliamentarians to do that job, not simply appointed officials answerable to the Prime Minister. L’Hon. Thomas Mulcair: Le – le projet de loi C-51 constitue une menace réelle à nos droits et libertés. Et encore une fois, il s’agit des faux choix de M. Harper. Est-ce que vous voulez la sécurité ou vous voulez vos droits et libertés? La même manière qu’il nous dit, par exemple, est-ce que vous voulez l’économie ou vous voulez qu’on s’occupe de l’environnement? C’est pas une question de l’un ou l’autre. Un Premier ministre a l’obligation de s’occuper des deux. Tandis que M. Trudeau tente désespérément de trouver des manières de justifier le projet de loi C-51, le NPD a pris une position de principe contre ce projet de loi parce que ça entache grièvement, gravement nos droits et libertés de la personne. Ça fait longtemps, M. Trudeau, puis c’est dans l’hymne national, il faut protéger à la fois nos foyers et nos droits. Ce projet de loi là, de la part de quiconque qui se prétend progressiste, aurait dû faire l’objet d’une analyse serrée pour conclure que ça compromettait nos droits et libertés. Fallait avoir le courage de voter contre C-51. Vous avez dit que vous aviez peur de M. Harper. C’est mot à mot ce que vous avez dit à l’Université de Colombie-Britannique. Essayez pas de changer l’histoire maintenant, M. Trudeau. Justin Trudeau: — vous savez très bien que moi, ma crainte dans tout cet enjeu-là, c’est que on ait une – une – une élection ancrée dans le débat sur la sécurité. Les Canadiens sont préoccupés par leurs emplois, par nos besoins en infrastructure, par de l’aide pour la classe moyenne et c’est de ça qu’il faut parler dans cette élection. Et la réalité, c’est que nous avons pris la position équilibrée que le Parti Libéral a toujours pris, de comprendre qu’il faut défendre à la fois nos droits et nos libertés. Justin Trudeau: –– that belies what Canada is. Rudyard Griffiths: –– to give you the last word. Rt. Hon. Stephen Harper: — the individual in question is already in prison and we will be able to remove him from the country under this law after he is released. That’s the difference. But are you seriously saying, Mr. Trudeau, we never be able to revoke citizenship from somebody? Rt. Hon. Stephen Harper: Is that your position? Rt. Hon. Stephen Harper: –– attacks against this country. Justin Trudeau: — you devalue the citizenship of every Canadian in this place and in this country when you break down and make it conditional for anyone. Justin Trudeau: You can’t do that. Rt. Hon. Stephen Harper: –– and (crosstalk) ever against this country. Rudyard Griffiths: Un instant, s’il-vous-plaît. Un instant. Rt. Hon. Stephen Harper: A few blocks – a few blocks from here, he would have detonated bombs that would have been on a scale of 9/11. Justin Trudeau: — we are not a country dominated by fear. Rt. Hon. Stephen Harper: –– of an individual like that. Rudyard Griffiths: Gentlemen. c’est tout. Justin Trudeau: This is a country of law and rights. Rudyard Griffiths: C’est tout. We’re out of time for that segment. (Laughter.) As lively as it was, we appreciate it. Merci pour ces débats très riches jusqu’à présent. I now want to change gears and move to the first of our three rapid reaction sessions. I want to start with you, Mr. Mulcair. The NPD is a strong proponent of spending more on foreign aid. Many Canadians, though, I think want to know, Mr. Mulcair, why we should spend billions more when we have so many urgent problems here at home. Make that case to the country. Hon. Thomas Mulcair: I think it is a fundamental Canadian value to do more to help the neediest in the world, to help on issues like international cases of poverty, help build democracy in the world, help defend women’s rights. Those are core Canadian values and don’t forget, we’ve dropped by about half the percentage of our gross national income that we’re dedicating now to foreign aid. We’re down to under 0.25 percent, which is lamentable compared to other countries. I mean, David Cameron’s Conservative government has brought that country up to the 0.7 percent that will be the goal. We’ll set a timeline for that with an NDP government to get us to that important goal of 0.7 percent because Canadians understand that it’s only by investing that we can help democracy, that we can help alleviate poverty but importantly as well we can help build Canada’s standing in the world. Rudyard Griffiths: Mr. Mulcair, I want to stop you there because this is a rapid reaction session. Gentlemen, let’s have a three-way debate on this topic. Qui commence? Justin Trudeau: I want to start, je veux commencer par surprendre quelques-uns sur ce dernier échange. Je veux féliciter le Premier ministre pour ce qu’il a commencé au niveau de la santé maternelle. Le Canada a pris un engagement et est en train de faire une grosse différence en matière de santé maternelle à travers le monde. Mais ça ne va pas vous surprendre que je déplore qu’il y a huit pour cent de la mortalité des mères reliée aux avortements non sécures et non faits comme il faut que nous nous devons d’aussi être engagés. Le Premier ministre est pris un petit peu dans son idéologie de ne pas pouvoir faire au complet tout ce qu’on devrait faire pour aider les mères, pour aider les personnes les plus vulnérables à travers le monde de sortir de la pauvreté. C’est pour ça que le Canada doit se réengager à aider les plus vulnérables basé sur la science, basé sur les meilleures pratiques et pas juste basé sur l’idéologie comme malheureusement le fait trop souvent notre Premier ministre. Le très hon. Stephen Harper: Pour déclarer le fait, pendant la période de ce gouvernement, depuis le dernier gouvernement l’aide humanitaire, l’aide étrangère du Canada a augmenté par 15 pour cent, mais nous sommes toujours préoccupés du fait que cette aide doit être utilisée de façon efficace et responsable et pour les vulnérables. Of course one of the things that we have led on, we’re very proud of is our child, maternal and newborn health initiative. We have been able to assemble an international coalition of countries, of international organizations, of private foundations to – frankly, often with minimal investment, to dramatically reduce child and maternal mortality in the developing world. This is something as Canadians – we are a very wealthy country, it’s something we can do. We know it’s effective and we’re very proud of doing it. I know we have lots of needs of our own but it is in our broader interest that we help people around the world when we can and when we know that that aid will actually be used responsibly and effectively and that’s what we’re always committed to. Rudyard Griffiths: Mr. Mulcair, please join. L’Hon. Thomas Mulcair: Dans les pays dont on est en train de parler il n’y a pas moins de 47 000 femmes qui vont mourir à défaut de pouvoir avoir accès à un avortement sécuritaire. On sait aujourd’hui que le viol est non seulement une arme de guerre, c’est devenu une stratégie de guerre. Il faut être réaliste. Il faut arrêter avec cette approche doctrinaire qui exclut la gamme complète de droits pour les femmes qu’on est en train d’aider dans ces pays-là. M. Harper, pour des raisons idéologiques, refuse catégoriquement. Moi, je n’admets pas que le Canada ne fasse pas sa part. Ça doit faire partie de notre approche en traitant de ces questions fondamentales. Le très hon. Stephen Harper: Ce gouvernement aide des services de santé très généreux mais évidemment nous sommes ici et notre plan est pour rallier le monde. And the reality is of course you can’t – you can’t go out in the world and unite the range of countries we have and independent and third party organizations, NGOs’s that we have and get into that kind of a debate. You need to concentrate on the things that unite people. Saving the lives of mothers and their newborns around the world is a cause that has united people, on which we have made real progress, and we need to keep going in that direction. It’s something we should be very proud of. Rudyard Griffiths: The last word to Mr. Trudeau. Justin Trudeau: En matière de développement international le Canada n’est pas en train de faire autant qu’on pourrait. Malheureusement, on n’a pas l’engagement qu’on avait jadis. Mais on a quand même, comme M. Harper l’a souligné, des ONG extraordinaires qui font du travail exceptionnel à travers le monde — des Canadiens impliqués dans Médecins sans frontières, dans Ingénieurs sans frontières, dans bien des enjeux. Nous nous devons de réengager au niveau de la planète parce que c’est dans notre intérêt et on a un apport constructif à amener. C’est ce qu’on va faire. C’est ce qu’on doit continuer de faire pour améliorer le sort des plus vulnérables partout dans le monde. Rudyard Griffiths: Thank you, Mr. Trudeau. Merci. Let’s move on to our second topic, our second rapid reaction topic. And Mr. Harper, the question is to you. You’ve made the point of visiting the Arctic every summer as Prime Minister, but under your leadership not one new icebreaker or deep water port has been built, and this at a time when you know the Russians have 40 icebreakers and as many as another 14 planned. What will you do to reassert Canada’s interests in the north? Rt. Hon. Stephen Harper: In fact we’re actually – the work has begun on the deep water port at Nanisivik. We’ve created an army Arctic training centre at Resolute Bay. We’ve increased our ability through purchases in the Air Force to reach the entire North. We’re investing in the RADARSAT constellation system to make sure we have better coverage on that basis. And of course we’ve expanded the Canadian Rangers who are our eyes and ears in the North. This helps local communities, and they patrol for us. But these are not – I should be clear, Rudyard, these are not the only investments we’re making. Obviously, we’re making sovereignty investments. We’re also making environmental investments, a hierarchy of research stations, the expansion of Nahanni National Park, economic investments like the building of the highway system to the Arctic coast, social investments in adult education and in housing and investments in governance. We signed a historic devolution agreement with the Government of the Northwest Territories to bring governance closest to the people. We are going to continue to make investments across a range of areas and of course we will continue to respond to the threat and to the risk that Russia in particular approaches of course in the Arctic, something we’ve warned about for a very long time. Rudyard Griffiths: M. Harper, merci. Merci. M. Trudeau, à vous de parler sur le sujet. Justin Trudeau: Mr. Harper, we’ve all seen the summer photo ops. In January the past year, I went up to the Arctic with my son Xavier, the way I had been able to do as a child, and one of the things in talking with communities and seeing how people are struggling through the winter with inadequate food security, with challenges around infrastructure. The one thing they keep saying about you up there, Mr. Harper, is your big sled, no dogs. (Laughter.) The challenge that we need to have is to understand that to have sovereignty over the Arctic, we have to support the communities, the people who live there, who have lived there for millennia. That is not what you’re doing enough of. We need to work with multilateral partners. Obama just convened the Arctic Council in Alaska last month and Canada was almost practically absent from that. We need to take real multilateral leadership on the Arctic and we need to start once again investing in science and research not to find ships but to actually detect what’s going on with the fragile Arctic ecosystems and make sure we’re serving the needs of our country. Rudyard Griffiths: Merci, M. Trudeau. Entrez dans la discussion, M. Mulcair. Hon. Thomas Mulcair: Any Arctic strategy has to begin with the people of the North. Moi, je suis très fier de dire que demain je retourne à Iqaluit dans la terre de Baffin. C’est une occasion extraordinaire pour nous de se rappeler les échecs de M. Harper, notamment avec la nourriture dans le Nord. Il a démantelé le programme qui fonctionnait avant et on a vu les résultats. When we brought cases to the House of Commons about people going into garbage cans to find food in the North, his Minister, Leona Aglukkaq, sat there in the House of Commons reading her newspaper. I think we have to show a lot more concern for the people of the North and we’ve also got to understand that Canada’s Arctic is the frontline of the battle against climate change. As the permafrost melts, we’re letting go a lot of methane, which as a greenhouse gas, is 20 times more powerful than CO2. It’s a catastrophic climate driver, and we’re going to have to start dealing with this issue seriously. Mr. Harper, of course, doesn’t agree. He doesn’t think there’s a problem. That’s why he’s made us the only country in the world to withdraw from the Kyoto Protocol. I know that it’s an urgent pressing issue that requires serious attention from a future Prime Minister. Rt. Hon. Stephen Harper: Look, I have given already a very partial list of the range of the new investments we’ve made in the Arctic. These are, frankly, without precedent in Canadian history across environmental, economic, social, sovereignty, governance dimensions. That’s why Northerners have responded so positively and so supportive to our agenda. This kind of attention was simply never paid to this part of the country before. If it now awakens the attention of the other parties, I’m happy about that. It’s about time the North defines our country. It’s about time it got support from all parties. I’m particularly proud that we have a remarkable Inuit woman who sits in the Cabinet of Canada. That is a real step forward in this country and a real sign that those people, that the Inuit and the North has really arrived in our country. Rudyard Griffiths: Gentlemen, we’ve got a minute left. I’m going to give 30 seconds to Mr. Trudeau and the last word to Mr. Mulcair. Justin Trudeau: Mr. Harper talks about icebreakers but the fact is we are underfunding even the military procurement for our Navy that we need to have right now, which is why I alone have made the decision, of these three gentlemen onstage, to cancel the expensive F35s, to plunge that money, any extra money, so we can still get quality planes at a better price and plunge the extra tens of billions of dollars into our Navy, so that we can once again protect the two-thirds of our coastline that ends up in the Arctic and the one-third of our landmass in the Arctic. Canada needs to re-engage and we need to actually fund it properly, and that’s what Mr. Harper hasn’t done. Rudyard Griffiths: Merci, M. Trudeau. Merci. Rt. Hon. Stephen Harper: We have record investments in shipbuilding right now, $35 billion. Justin Trudeau: And you can’t build the ships you promised. Rt. Hon. Stephen Harper: We’re going on – we’re going down on – at all of our shipyards, and we do that, Mr. Trudeau, without promising to run deficits and without hiking people’s taxes. Rudyard Griffiths: Il reste peu de temps. Il reste peu de temps. The last word to Mr. Mulcair please. Hon. Thomas Mulcair: Thank you, Rudyard. Dans le Nord canadien, comme on a pu voir de retour de Kuujjuaq récemment avec mon ami et collègue Roméo Saganash, il y a une crise particulière qui concerne le logement. J’ai vu les maisons avec 18 personnes dedans dans deux pièces. Quand est-ce qu’un enfant est censé pouvoir faire ses devoirs? C’est une crise sociale et économique qui est en train de faire des ravages sur les prochaines générations. C’est une obligation d’État. Ça reflète nos valeurs profondes canadiennes et j’ai l’intention de m’y attaquer dès que je deviens le Premier ministre du Canada. Ça va être une première priorité de régler une fois pour toute la crise du logement pour nos Premières nations, Inuit et Métis. Rudyard Griffiths: Merci. Thank you, gentlemen. Let’s move on to the last of our three rapid reaction discussions. You’re all aware, I’m sure you’ve thought a lot about this, that the biggest foreign policy challenge of the moment surely is the aggressive and unpredictable behaviour of Russia on the world stage. Mr. Trudeau, if you become Prime Minister how will you deal with Vladimir Putin? Justin Trudeau: I think there’s no question we have to recognize that Russia has become, as you say, a destabilizing force around the world. He’s destabilizing Eastern Europe with his unacceptable incursions into Ukraine. He is pushing in blocking the achievement of cease-fires and stabilizing and stopping the bombings and war in Syria and he’s being a provocative agent in the Arctic, which requires Canada to stand firm with our multilateral partners to push back with strong sanctions and as a strong part of NATO against that. Now Mr. Harper has made a big deal out of talking loudly and strongly at Mr. Putin, but the reality is Canada has such a diminished voice on the world stage that Mr. Harper hasn’t noticed that Vladimir Putin didn’t listen to him when he told him to get out of Ukraine, and that is, unfortunately, a reflection of where we are, where we don’t have the impact we used to have in multilateral organizations to push back effectively against bullies like Vladimir Putin. Rt. Hon. Stephen Harper: Well, it’s fascinating to hear these other parties talk about their fears and their concerns about Mr. Putin. For years, they accused this government of being alarmist as we pointed out to the world the deterioration of democracy and human rights in Russia under his rule and his increasingly aggressive and destabilizing behaviour internationally. I have met with Mr. Putin many times. Everybody knows of course when it came to Ukraine I’ve made it very clear to Mr. Putin that Canada, this country is never going to tolerate or accept under any circumstances his occupation of the Ukrainian territory. This was a position we took with the Baltic states annexed by the Soviet Union in 1939. We held to this position with our allies for over 50 years, and when the time came, those countries became independent. I’ve said to President Poroshenko and others that this country will continue to work with our allies to make sure we never in any way recognize or accept Russian occupation of any square inch of Ukrainian territory. Hon. Thomas Mulcair: The NDP stands four square with the people of Ukraine against this Russian invasion and we will stay there for the long term, but it’s interesting to hear Mr. Trudeau say what he’s going to do with Mr. Putin. Mr. Trudeau, you can’t even stand up to Stephen Harper on C-51. How are you going to stand up to Putin? Mr. Harper talks a good game with regards to dealing with Mr. Putin, but the fact is that there are two people, Yakunin and Sechin, who are on the list of some of our closest allies, including the Americans. Now Mr. – Mr. Harper has refused to put them on the list of sanctions for Canada. You know why? Because they’ve got important business dealings here in Canada. He’s going to tell us he’s got a longer list than anybody else. That’s like saying that Paul Dewar is on Putin’s list, which he is, but not going to have much effect. The rest of the people on that list don’t matter much, but these two count. Yakunin and Sechin should be on Canada’s sanctions list. They’re not because Mr. Harper talks a good game about dealing with Putin, but two of his closest allies, two of his closest buddies are not being sanctioned because of their Canadian connections. Mr. Harper is protecting them instead of sanctioning them. Hon. Thomas Mulcair: They’re listed by the Americans, Mr. Harper. Hon. Thomas Mulcair: They’re listed by the Americans. Rt. Hon. Stephen Harper: — that particular – those particular cases. But no one should doubt, and I think the world has recognized, the Ukrainians themselves have recognized it, no country has responded more comprehensively to Ukraine’s needs whether they be nonlethal military aid, training, humanitarian, financial assistance. I’ve been to Ukraine, met with President Poroshenko right during this crisis. No country, no government in the world has stood with the people of Ukraine any more than this government has. Justin Trudeau: Canada will continue – and Canada will continue to stand with Ukraine. When I chatted with President Poroshenko in Ottawa along with Chrystia Freeland, who has done an extraordinary job representing Canada in a nonpolitical way to the people of Ukraine and on this issue, we have seen tremendous – tremendous impact locally, but at the same time, we are a country that used to have a lot more influence and when Canada said something we were listened to on the world stage, and that has been diminished over the past years because of our withdrawal from international consensus-building, from working with multilateral partners as a positive, constructive actor in our national interest. And that’s what we need to get back to, so we can make a difference in holding our ground against Putin and against bullies around the world. Rudyard Griffiths: Great. Thank you, gentlemen, for three very good rapid reaction discussions. Let’s now return to our longer format exchanges. I want to begin by focussing on the topic of Canada- U.S. relations. Mr. Harper, you were unable to convince Barack Obama to build the Keystone pipeline. What does this failure tell you about how we should manage the Canada-U.S. relationship going forward? Rt. Hon. Stephen Harper: Barack Obama and I have discussed this particular matter. He said to me there’s nothing he’s asking Canada to do. He’s going to make that decision based on his own assessment of American interests. Look, this government has worked with two radically different administrations in the United States, and we have worked productively with both. Right now, if you look around the world at the things we have been working on with our partners in the United States, they include, obviously, the mission we talked about earlier against the so-called Islamic State. We’re working closely with the United States in our response to the crisis in Ukraine and in reassurance to our allies, our Eastern European allies with NATO. We’ve worked together on the Ebola crisis. We have a clean energy and climate change dialogue that we’ve worked productively with the United States on joint regulations in that particular area. We have a project of unprecedented scope called Beyond the Border in which we are doing more to better integrate our security and try and thin border processes between Canada and the United States, vitally important to our trade. We’re working together, sometimes not always agreeing on international trade negotiations. Look, Canada has a good relationship with the United States. We work productively overall, but at the same time, the responsibility of the Prime Minster of Canada is to stand up for Canadian interests. Where it’s necessary to take a different position from the United States, we do that. Rudyard Griffiths: Mr. Mulcair, please enter into a seven-minute one-on-one with Mr. Harper on this topic. Hon. Thomas Mulcair: It’s very difficult to see how Canada’s superior interests were being served when Prime Minister Harper said to President Obama that it was a complete no-brainer that the Americans had — those were his exact words — that the Americans had to approve Keystone XL. I know that Keystone XL represents the export of 40,000 Canadian jobs because Mr. Harper told the Americans so. That was the same number that his Finance Minister used. I want to create those jobs in Canada. I think that Mr. Harper takes a wrong approach when he does things like that. He also informed the Americans that on Keystone XL — and this is another direct quote from him and his government — “I won’t take no for an answer.” Guess what? The answer was no, and you weren’t able to do anything about it. Now every progressive in the United States is against Keystone XL. Mr. Trudeau and Mr. Harper are in favour of Keystone XL the same way they’re both in favour of Bill C-51. Progressives in Canada are against C-51. Progressives in all of North America understand it’s time to start dealing with these issues seriously and both Mr. Harper and Mr. Trudeau have failed on Keystone. Rt. Hon. Stephen Harper: I look at the facts of the Keystone XL pipeline. I’m simply citing the report done by the U.S. State Department itself, which actually did an independent analysis of this. It creates jobs on both sides of the border, of course as exports always do. I understand the protectionists in the NDP don’t recognize that, but that’s a fact. It’s good for our energy security, displacing foreign oil from countries that are, quite frankly, security risks to North America. And compared to the alternatives, it is by far the best environmental solution in terms of moving our product to market. We have a strong case. I would also point out the reason I say this will be adopted eventually is through the efforts of our Embassy and this government we have created overwhelming public support in the United States for this position on both sides of the aisle in Congress, in clear majorities in public opinion. It is my view that when something – the logic of something is overwhelming on an environmental, economic and energy security sense, that its adoption is inevitable. We will continue to make the case and make the case aggressively. Look, as I say, we far more enough than not agree with our American friends but when we do not, we have to stand up for our interests and we have to be very aggressive and vocal in pushing for Canada’s best interests. Hon. Thomas Mulcair: Well, that’s a wonderful idea, but when you actually need the approval of your colleague for something you’re pushing for, the last thing you should be doing is saying that it’s a complete no-brainer or that you won’t take no for an answer or your closer on this whole thing, which was to tell the American administration of President Obama that if you didn’t get it with this administration, you’ll get it with the next administration. There’s an old saying, Mr. Harper, that you catch more flies with honey than with vinegar. Rt. Hon. Stephen Harper: We’ll keep fighting, Mr. Mulcair. Hon. Thomas Mulcair: I think you were pouring vinegar by the gallon on the Americans, and it’s not a surprise that they were saying no to you. You’re right, though, that there are times when our approach will be different from that of the Americans, and our job is to stand up for Canada. On issues like trade, like climate, like security, overall, we’re going to be in agreement with them. We do have to stand up for Canadian values, but what’s the Canadian value in exporting 40,000 Canadian jobs to the U.S.? It doesn’t make any sense. Rt. Hon. Stephen Harper: You know, Mr. Mulcair, this is – it’s really fundamental. It is amazing that the NDP actually believes that because we export our products and that helps create jobs elsewhere, that’s somehow bad for Canada. The reason trade is so important is it creates economic opportunities on both sides of the border. You know, I personally have people who – friends who work in this industry, ordinary families who depend on the revenue from this industry. The industry and labour organizations in both the United States and Canada are supportive of this. Labour unions in Alberta say the NDP’s position on this is wrong. You can’t – we cannot take, in the modern global economy of the 21st century, an ideological opposition to trade. Being able to sell our energy products, our other products around the world, is a good thing for Canada. Hon. Thomas Mulcair: This is a very old hat approach from the Conservatives. This is the same approach that’s failed in the past where we rip and ship our natural resources in as raw a state as possible and send them to another country. The way to build for the future sustainable development of our resources includes basic principles like polluter pay, which Mr. Harper has never applied, which includes putting the cost to the environment, the climate, the greenhouse gasses into your evaluation. We don’t have a complete thorough credible environmental assessment process left in Canada. And by the way, Mr. Harper has failed, not only in the United States with Keystone, but on his watch there’s not a single kilometre in 10 years of pipeline that’s been built in Canada, and there’s a reason for it. You can force the matter and gut environmental legislation like he did, the Navigable Waters Protection Act, Species at Risk, Fisheries, but unless the public’s onside, it’s not going to get built, and that’s what’s happened. Mr. Harper has only himself to blame. We’ve got to start adding value to our resources here in Canada. Hon. Thomas Mulcair: (Crosstalk) jobs here. Rudyard Griffiths: — we’ve gotten – we’ve gotten off topic here, so I’d like to now bring in Mr. Trudeau for his thoughts on the Canada-U.S. relationship. And, gentlemen, that’s what I want us to focus on in this section. Justin Trudeau: Our relationship with the U.S. is the most important foreign relationship that Canada has. How the Prime Minister can work with the President is at the top of the list of what a Prime Minister needs to get right. They’re our most valuable and trusted ally. They’re our nearest neighbour, and they’re our most important trading partner. How we engage to ensure that there are jobs for Canadians and economic growth is deeply wrapped in how we’re getting along. Unfortunately, Mr. Harper has narrowed the entire relationship with the United States to a single point around the Keystone XL pipeline, and he went to New York and criticized and harangued the President. That is not the kind of relationship we need because not only does it not get the outcome that was desired of getting an approval for the Keystone XL pipeline, it also interferes with our capacity to deal with other issues because it’s, quite frankly, all Mr. Harper and his Ministers wanted to talk to the U.S. about. Whether it’s Buy American, whether it’s the auto sector and the TPP negotiations going on, whether it’s just jobs and growth for Canadians, the fact is that Canadians are sitting around worried about their jobs because we have a Prime Minister that doesn’t like Barack Obama. We need to do much better than that and that personal relationship that Mr. Harper has had difficulty creating, not just with the U.S. President, he doesn’t share his ideology but with Premiers across the country and municipalities and a wide range of people. It’s injuring these relationships that mean jobs and growth. How we build our industry depends on the U.S.
Rudyard Griffiths: Mr. Trudeau, let’s – let’s bring in Mr. Harper to reply. Rt. Hon. Stephen Harper: We have a great relationship with the U.S. Administration. I have a great relationship with President Obama. (Laughter.) And by the way, the Americans have never said otherwise and neither have we. This is just an invention. In fact, what we have actually been able to do is stand up for our interests on things like Keystone while pursuing a broad range of initiatives with our American partners. Now, I ask you to look at the alternative. Imagine first day of office that we would have a Prime Minister who would say to the United States, “We are pulling out of the joint military mission against the Islamic State. And why? Because you, Mr. Obama, are continuing the policies of George W. Bush.” Seriously, if you really want to poison the relationship, that would be the way to do it. We are acting with the Americans around the world, and we share interests. Rudyard Griffiths: Mr. Trudeau, I want to – I want to ask Mr. Mulcair to respond to that because it goes right to the heart of his policies regarding the Islamic State and the international coalition, so please. Hon. Thomas Mulcair: And our relation with the United States. Hon. Thomas Mulcair: It’s interesting to hear the Prime Minister cite our allies only when it suits his purpose, and it’s not based on a question of values. So in the case of fighting the Islamic State, he’ll say, well, we have to do the same as the Americans, the British and the French because they’re involved in this combat mission. When it comes to the deal that France, the United States and Great Britain helped ensure that Iran’s nuclear ambitions were peeled back, Mr. Harper attacks that as being wrongheaded. So it’s not a question of the fact that some of our allies agree and some of us don’t. We just said the same thing, Mr. Harper, that when it’s not in Canada’s interests, we’ll stand up for what Canada needs. And I know that Canada can get back to being a voice for reason. I want to put Canada on track. I want us to be able to fight the flow of arms, fight the flow of money, fight the flow of foreign fighters, but I also know that an independent Canadian foreign policy means that fundamental Canadian values like fighting harder for peace than for war is what I will bring to my tenure as Prime Minister. Rudyard Griffiths: We’ve got a minute left and I want to give you the last word on this topic because you came in first. Mr. Harper, please. Rt. Hon. Stephen Harper: We have congratulated our allies on working to get a deal with the Iranian regime, but the proof of that will obviously be in the implementation of that deal. We will believe Iran’s words and not its actions and I think our allies will take a very similar position. I fully admit that we don’t always take the position of our allies. Sometimes, we take our positions based on what we believe are principles. Let me give you a clear example. This government has been perhaps the most unequivocal in the world on the fact that when it comes to the Middle East, we are not going to single out Israel. It is the one western democratic ally. Threats that are directed at that state is on the frontline of the threats directed at us. We are not going to single out the Jewish state for attack and criticism. We recognize unequivocally the right of Israel to be a Jewish state and to defend itself. Rudyard Griffiths: Last word to Mr. Trudeau. Justin Trudeau: The issue of Israel where we most disagree as Liberals with Mr. Harper is that he has made support for Israel a domestic political football when all three of us support Israel and any Canadian government will. But on the question of the U.S. relationship, what we need to make sure is that we continue to engage as a robust member of the coalition fighting to defeat ISIS. There are many countries that don’t have a direct combat role and Canada has proven time and time again that we can contribute. And for our closest friend and allies in the U.S., to relaunch UN peacekeeping today and not have Canada stepping up to say yes, this is a Canadian thing that we can do well and we will support is yet another missed opportunity to have that positive relationship which ultimately means more jobs and more growth for Canadians. Rudyard Griffiths: Thank you, gentlemen. We’re going to move on to our next topic. In a matter of weeks, we all know world leaders will gather in Paris to negotiate a new global climate change agreement. Mr. Trudeau, Liberal and Conservative governments alike have failed to meet their international commitments to reduce greenhouse gas emissions. Why should Canadians believe that your government will be any different? Justin Trudeau: Nous reconnaissons que le défi auquel les gens s’attendent qu’on adresse en tant que gouvernement, c’est de comprendre que l’environnement et l’économie vont ensemble. Nous ne pouvons plus les séparer, et d’ailleurs quand on n’a pas agit en matière de réduction de gaz à effet de serre pendant long-, de longues années, ça nuit à notre économie, ça nuit à nos relations avec les États-Unis. Ça nuit avec nos relations internationales. Donc, ce que le Parti Libéral dit, ce que je dis maintenant, c’est on met de côté ce jeu politique d’annoncer des cibles optimistes et ambitieuses sans avoir aucun plan pour les livrer. Et nous, ce qu’on a fait le choix de faire c’est d’investir massivement de façon à réduire nos émissions. On parle de 20 milliards de dollars sur 10 ans à investir dans le transport collectif, ce qui va réduire nos émissions en matières de transport. On parle de 20 milliards de dollars sur 10 ans en infrastructure verte et durable pour qu’on puisse arriver à réduire notre impact en gaz à effet de serre. Et aussi, nous allons investir des centaines de millions de dollars pour développer des technologies vertes de l’énergie propre. Et dans tout ça, nous allons travailler avec les provinces parce que la réalité, c’est que de – dans 10 ans de M. Harper, les provinces ont dû y aller seules. Et on a quatre provinces qui ont mis un prix sur le carbone de différentes façons, et nous nous devons d’avoir un gouvernement fédéral là pour les appuyer, là pour présenter un front uni à Paris dans quelques mois pour démontrer que le Canada est de retour sur la bonne voie. Rudyard Griffiths: Merci, M. Trudeau. M. Harper, allez-y, entre dans la discussion avec M. Trudeau. Le très hon. Stephen Harper: Je peux dire que pour la toute première fois de l’histoire, pendant la décennie passée, le Canada a eu une croissance économique avec une réduction des émissions de gaz à effet de serre. And that’s the first time in history that has happened in the past decade. We’ve had economic growth, but we’ve also had a reduction in global greenhouse gas emissions. As pertains to the conference coming up in Paris, you know, when we came to office a decade ago, we took a position that was considered very radical, opposed by the other parties and by many in the international community. We said that an effective international protocol had to include targets for all major emitters. We now – the Chinese and the Americans who were not a part of the previous protocol are now committed to moving forward with that. And I am very optimistic. We have established targets very, very similar to our major partners. We’re working with the United States and others, particularly the United States on – on regulatory systems on greenhouse gas emissions, and I am very optimistic we will reach a historical accord in Paris this year. Justin Trudeau: Vous savez, il, il dit ça, il parle comme ça tout le temps, comme si le Canada est un leader en matières d’environnement. Je pense qu’il commence même à se croire (rires) là-dessus. La réalité, c’est que tout le monde le sait que M. Harper n’a pas compris un élément de base fondamental: que l’environnement et l’économie, ça va ensemble. Si vous – nous allons, si nous allons créer les emplois de l’avenir, la prospérité économique durable pour nos enfants et nos petits-enfants, nous nous devons de faire nos devoirs au niveau de l’environnement, protéger notre terre, nos eaux, notre – notre air. Malheureusement, M. Harper, parce qu’il a rien fait sur l’environnement depuis 10 ans, est en train de nuire à notre économie. On n’arrive pas à exporter nos ressources vers les marchés. On est en train de – de se faire traiter de – de – de lâches et de nuiseurs sur – à l’échelle internationale parce qu’on est obstructionniste dans les négociations au niveau des changements climatiques. La réalité, c’est que tout le monde le sait. On n’est nulle part sur l’environnement. Les Canadiens sont frustrés, le monde entier est frustré envers le Canada. Il est temps que ça change. Il est temps qu’on ait un Premier ministre qui se tient debout, qui comprenne que l’environnement et l’économie, ça va ensemble. Le très hon. Stephen Harper: La chose incroyable, que nous avons pour la première fois une réduction de gaz à effet de serre et un vrai plan de réglementation. On a pris des actions. Comparez ça avec le bilan que défend M. Trudeau de l’ancien gouvernement qui a eu le pire bilan de – de – d’augmentation de gaz à effet de serre du monde. Justin Trudeau: Talk about 10 years with you. Rt. Hon. Stephen Harper: –– under our government. Under the previous government, they established the toughest standards in the world, and then missed them by the most of any single country. They were 30 percent over their targets. And when we got to office, they didn’t have a single plan to achieve anything. Justin Trudeau: That’s not true. Justin Trudeau: You know that’s not true, Mr. Harper. Rt. Hon. Stephen Harper: –– we have moved forward on regulatory matters in the transportation sector and the electricity centre – sector, and we’re going to continue to move forward. We have a real plan. We’re taking actions. And by the way, we’re doing that without imposing carbon taxes on the Canadian population. Justin Trudeau: Non. M. – M – M. Harper, ce que vous – vous reconnaissez pas, c’est que ils ont déjà 86 pour centre de notre économie a annoncé un prix sur le carbone parce que malgré votre inaction totale en matières de réduction de gaz à effet de serre – et vous aussi, vous avez mis de l’avant des cibles qui ne seront pas rencontrées et c’est pour ça que nous, nous mettons de l’argent devant, et pas des cibles devant. Vous avez, dans votre – vos années d’inaction, vu quatre différentes provinces prendre le leadership nécessaire. La Colombie-Britannique a une taxe sur le carbone extrêmement bien réussie. Votre province de l’Alberta a fait la même chose de leur façon. L’Ontario et le Québec s’engagent dans une bourse du carbone. Nous avons un leadership réel des provinces qui n’attendent qu’un gouvernement à Ottawa les appuie et comprennent que nous avons du travail à faire ensemble aussi. Mais vous, vous préféreriez vous, vous obstruc-, vous – vous asseoir pour ne pas regarder ce qui doit être fait et la réalité c’est qu’on est en train d’en perdre à tous les jours dans notre réputation internationale. En 2008, quand Barack Obama est venu à Ottawa pour la première fois, il a parlé justement de – d’un – d’une approche continentale intégrée, mais vous n’avez rien fait avec lui depuis ce temps-là et là, les États-Unis y vont tous seuls parce que le Canada ne fait pas partie de la solution. Nous, nous voulons nous réengager avec les États-Unis, avec le Mexique pour avoir une approche réellement intégrée sur l’énergie, sur l’environnement, sur la croissance économique que nous pouvons faire ensemble. C’est ça le leadership que vous n’avez pas eu depuis 10 ans. Le très hon. Stephen Harper: On – on ne va jamais pris (sic) – on ne va jamais tirer des leçons du parti avec le pire bilan de l’histoire de la planète sur les émissions de gaz à effet de serre. C’est le Parti Libéral de Ca-, du Canada. But let’s talk about what we actually have done. We talk about the meetings with Mr. Obama. We have embarked on a system, what we – what we are doing in our government is we are not – we are making sure we know exactly where we’re going to reduce emissions in a way that preserves jobs and doesn’t impose costs on consumers. We’re proceeding with a sector by sector regulatory approach. In the transportation and other sectors, methane and oil and gas, for example, we are proceeding in collaboration with the United States. Rt. Hon. Stephen Harper: –– Canadian consumers. Justin Trudeau: –– from your – from your gang in Ottawa. Justin Trudeau: –– and then, at the same time, now taking credit for it. Justin Trudeau: Mr. – Mr. Harper, (applause) these people know better than what you’re trying to say. Rt. Hon. Stephen Harper: –– put in place at the national level, it’s a binding system of regulation in collaboration not just with the province of Ontario, but Nova Scotia, Alberta, Saskatchewan, all of the provinces that use coal-fired electricity. It’s an example of collaboration. We’re eliminating coal-fired electricity. And guess what? You talk about the United States. Emissions from their coal-fired electricity sector, from their electricity sector are bigger than emissions from the entire Canadian economy. We’re leading the world on this fa-, on this sector. Rudyard Griffiths: Merci, M. Harper. Allez-y, M. Mulcair, entres dans la discussion avec eux deux. L’Hon. Thomas Mulcair: En fait, ça risque de surprendre quelques-uns, mais M. Harper a totalement raison lorsqu’il dit que les Libéraux ont utilisé leur signature de Kyoto comme exercice de relations publiques. Il a aussi raison quand il dit que l’ancien gouvernement Libéral avait le pire bilan sauf Kazakhstan, sauf erreur de ma part. Sauf que c’est pas un prétexte de continuer de rien faire. I have a track record that you can easily refer to. Those figures are published. Every year that I was the Minister of the Environment in Quebec, I actually was able to reduce greenhouse gas emissions in Quebec. We had a clear plan to do it. The NDP has a clear plan to reduce greenhouse gas emissions in Canada. We’re going to be basing ourselves largely on the successful cap-and-trade model that we used in Canada and in the U.S. to reduce SO2 emissions that was causing a-, acid rain. It works. Justin Trudeau: Fourteen billion dollars in infrastructure isn’t fake, Mr. Mulcair. Justin Trudeau: Mr. Mulcair is yet again making the kinds of announcements that aren’t following up – aren’t followed up by any real plan to achieve this because Mr. Mulcair has taken the decision that what he has to do at all costs is balance Mr. Harper’s budget. He cannot make the kinds of investments that the Liberal Party is choosing to make in the kinds of things that Canada needs right now because yes, we have chosen to run three modest deficits to balance the budget by 2019 because the time to invest is now. The time to take action on climate change is now. Hon. Thomas Mulcair: I leave the pomp to you, Justin. Hon. Thomas Mulcair: Actually, Mr. Trudeau, Alberta is of one mind with us on the obligation of result. But this is about sustainable development. And when you say that your only way of governing is going to be dump a massive economic debt on the backs of future generations, you’re right. We strongly disagree with you because Mr. Harper has left a huge ecological debt on the backs of future generations. And the last time the Liberals were in power with their 24 percent cut to social and health transfers, that left a huge social debt on the backs of future generations. Tommy Douglas took over a Saskatchewan that the Liberals had left in bankruptcy, ran 17 consecutive balanced budgets in a row and brought in free universal public medical care. Hon. Thomas Mulcair: –– future generations. Rudyard Griffiths: –– have gone from climate change to balanced budgets. Hon. Thomas Mulcair: –– of balanced budgets. Rudyard Griffiths: –– climate change and the Paris negotiations. Rt. Hon. Stephen Harper: –– both of these parties will never actually lay out precisely where it is they intend to reduce emissions. The advantage of proceeding sector by sector is you actually know what you’re going to do and you’re able to – able to make sure you minimize the cost on jobs and the Canadian economy. We’re also investing ov-, a billion a year, have been for 10 years on green energy and energy efficiency. The only real policies ever proposed by either of these parties are effectively carbon taxes where we would hit consumers. And frankly, carbon taxes are not about reducing emissions. They’re about raising revenue for the government. The case of – Mr. Trudeau’s right, in the case of Mr. Mulcair’s plan, it’s already been rejected by an NDP government in Alberta. Hon. Thomas Mulcair: It’s not true. Rt. Hon. Stephen Harper: That tells you where it’s going. Hon. Thomas Mulcair: Completely false. Rudyard Griffiths: Okay, gentlemen, we’re going to wrap up that topic and move on to our final long form discussion. Mr. Mulcair, I want to start with you. Your party is opposed publicly to making concessions on supply management and aspects of auto manufacturing in the context of the current Trans-Pacific Partnership negotiations. Does this mean that under an NDP-led government Canada would be locked out of some of the world’s fastest-growing markets? L’Hon. Thomas Mulcair: Merci beaucoup. Regardes, oui, plus tôt cette semaine, j’ai eu l’occasion de parler avec Marcel Groleau qui est le président de l’Union des producteurs agricoles. Et comme nous, il est très préoccupé parce que j’ai écrit au Premier ministre Harper, le sommant de s’engager clairement sans ambages à défendre intégralement notre système de gestion de l’offre, qui est un système dont on peut être fier. Quand on se compare aux autres qui subventionnent à qui mieux mieux, on n’a pas d’excuses à donner pour notre système de gestion de l’offre. Alors les fermes avicoles, les fermes de production laitière à travers le Québec et dans le Sud de l’Ontario et ailleurs au Canada sont extrêmement préoccupées parce qu’ils savent qu’avec trois semaines avant l’élection tout est permis. After we finished the last debate, Mr. Harper went public and he said if you’re in the auto sector, you should be worried about what he’s negotiating in the Trans-Pacific Partnership. On Mr. Harper’s watch, we’ve already lost 400,000 well-paid manufacturing jobs. There are 80,000 well-paid manufacturing jobs in the auto sector. What’s on the table? When President Obama wanted to discuss this this week — this is how good the relationship is — he phoned the President of Mexico. We were frozen out. I’m quite concerned about what’s being left on the table by the Conservatives. And our dairy farmers have every right to be concerned; I think that supply management is on the table. And Mr. Harper doesn’t keep his word on these things. Ask anybody in Newfoundland and Labrador. When he got their approval for the European trade deal, it was on a promise to give them money to compensate what they were giving up in terms of processing a fish. And you know what? He broke his promise. Rudyard Griffiths: M. Trudeau, quelle est votre opinion sur la question? Justin Trudeau: Bien, c’est sûr que nous avons pu signer bien des accords à l’international sans mettre en danger notre – notre système agricole de gestion de l’offre. La réalité c’est que M. Harper, comme il a toujours fait, est en train de démontrer un manque complet de transparence, pas en train de dire ce qu’il est en train de faire, et comme M. Mulcair le souligne bien, M. Harper régulièrement est en train de briser sa parole sur – revenir sur sa parole sur bien des enjeux au niveau de promesses faites en matière de commerce international. Nous avons besoin d’accords de commerce international. On sait que c’est bon pour les emplois. On a besoin d’attirer de l’investissement. C’est la réalité que nous devons, et on peut pas faire semblant non plus que le monde est un marché libre en termes d’agriculture. Nous – on a – on a un système qui fonctionne, et on a signé des accords très importants sans le mettre en péril. Mais nous avons besoin de ces accords-là. Nous avons besoin d’attirer de l’investissement étranger. Nous avons besoin pour créer des emplois ici au Canada. Vous savez que des secteurs qui – manufacturiers et exportateurs paient 50 pour cent plus élevé en salaires aux Canadiens de la classe moyenne que les secteurs qui n’exportent pas. Le commerce international est essentiel pour le Canada. M. Harper aime bien parler de son appui et des accords qu’il a signés, mais notre – nos exportations ont eu le pire taux de croissance sous son gouvernement depuis la deuxième guerre mondiale. Il n’est pas en train de livrer à ce niveau-là. L’Hon. Thomas Mulcair: Moi, je vais vous dire que lorsqu’on regarde le bilan des libéraux en la matière, rappelez-vous pour se faire élire Jean Chrétien avait promis dans son Livre rouge, le même Livre rouge où il avait promis d’abolir la TPS — vous vous souvenez du Livre rouge? Dans ce Livre rouge c’était écrit qu’il allait déchirer l’Accord du libre échange nord-américain dès qu’il format un gouvernement. Il a évidemment rien fait de la sorte. C’est pour ça qu’il faut faire tellement attention avant de les signer parce qu’une fois que c’est mal trissé, une fois que ça rentre dans les moeurs, une fois que tout le monde dépend, c’est extrêmement difficile de toucher. Il y a des aspects de l’ALÉNA, notamment en ce qui concerne la capacité de l’État de protéger la santé et l’environnement qui ont causé problème — le chapitre 11 était un vrai défi. M. Trudeau a dit qu’il appuyait l’entente avec l’Europe avant de l’avoir lu. Comment je sais qu’il l’avait pas lu? Parce que ça avait pas encore été publié. Il s’est levé à la Chambre des communes pour féliciter chaudement M. Harper pour son entente avec l’Europe. Il y a des aspects de cette entente-là, comme les dispositions sur l’État investisseur, qui nous préoccupent et qui préoccupent plusieurs pays de l’Europe. C’est pour ça que même s’il l’a déjà annoncé une demi-douzaine de fois, il y a pas encore d’entente avec l’Europe. On va arrêter de faire semblant qu’on peut avancer juste à coup de slogans de la part des conservateurs ou sans les avoir lus. Moi, je n’accepterais jamais sur des questions cruciales d’environnement ou de santé ou autres que je laisse un panel non défini d’experts internationaux commencer à décider ce que je devrais avoir le droit de décider dans l’intérêt du public. Ça c’est une valeur fondamentale canadienne de maintenir l’autorité de l’État de prendre ces décisions-là dans l’intérêt du public. Justin Trudeau: Vous savez, M. Mulcair on le sait est en train d’essayer de changer le NPD pour être plus à son image, mais la réalité c’est que il a encore énormément de difficulté à comprendre que nous avons besoin des accords de commerce international pour bâtir un avenir plus fort pour nos travailleurs, pour notre économie. Le Parti NPD n’appuie aucun accord de commerce international qu’on a signé dans les années récentes. Il est – ah, non, c’est vrai, il en a appuyé un avec la Jordanie. C’est le seul qu’il a accepté. L’Hon. Thomas Mulcair: C’est faux. Justin Trudeau: La réalité c’est que c’est un gouverne-, c’est un parti qui a toujours – n’a pas compris à quel point c’est important d’attirer de l’investissement envers le Canada, d’avoir des marchés pour l’exportation, d’être engagé avec les économies grandissantes de l’Asie. Nous avons un besoin d’être engagés. Et oui, le Parti libéral est – croit fermement aux accords internationaux. Nous savons que c’est essentiel pour la croissance économique, pour créer des bons emplois pour les Canadiens. C’est pour ça que nous avons applaudi l’accord Canada-Europe. Mais effectivement, comme beaucoup d’autres accords, M. Harper n’a pas fini de livrer encore. On n’est nulle part avec la Chine, même si l’Australie vient juste de signer. On est en tout début avec l’Inde, malgré le rapprochement que M. Harper a essayé de faire récemment avec le Premier ministre. Et avec les États-Unis, on en souffre au niveau de l’échange du commerce international. Mais la réalité c’est que je viens de penser, oui, il y a un enjeu que M. Mulcair veut entrer en échange avec les États-Unis et ça c’est l’exportation de l’eau en vrac. Hon. Thomas Mulcair: That’s false, Justin, and you know it. Justin Trudeau: — to the United States. You gave a speech on it. Hon. Thomas Mulcair: That’s false. Hon. Thomas Mulcair: That’s false, Justin. Justin Trudeau: — you are willing to sell our water to the United States. Rudyard Griffiths: Please jump in, Mr. Mulcair. An accusation’s been made. We’d like you to respond. Hon. Thomas Mulcair: Sure. First of all, with regard to trade deals, the – it was a trade deal with Korea that was backed by the NDP, so Mr. Trudeau is inventing facts once again. When I was the Minister, we had lots of debates, but the important thing to look at is what we decided, and I decided to shut the door because bulk water exports would have been a terrible idea, especially under the North America Free Trade Agreement and the Proportionality Clause, and we made sure that we shut the door and we locked it tight. Justin Trudeau: We’ve had 10 years of (crosstalk). We don’t need it from you, Mr. Mulcair. Hon. Thomas Mulcair: — it is a representation – it is a representation of what the NDP knows how to do. We are looking for an even playing field. We are looking for trade agreements with countries that share our values, whether it’s the protection of the environment or the protection of workers’ rights. This is an even playing field. This can be about reciprocity. But what we won’t do is what Mr. Harper’s done is sign deals with countries like Honduras who, right after a coup, Mr. Harper ran to try to make a deal with Honduras. That’s a country that doesn’t respect workers’ rights. It doesn’t respect human rights, and we shouldn’t be putting them on an even playing field with us because we’re communicating that we find that’s okay. Same thing with our trade deal with Colombia. There are times when you have to stand up and say Canadians expect their government to reflect their values when they’re putting their name on a trade agreement, and Mr. Harper has consistently failed to show any respect for those fundamental Canadian values. Rudyard Griffiths: Mr. Mulcair, I need to go to Mr. Harper now. Rt. Hon. Stephen Harper: In the 21st century, the global economy, the creation and the retention of good-paying jobs are going to depend vitally on having privileged trade access to the major economies of the world. We’ve been able to achieve deals in this continent, with Europe and now with – with the Republic of Korea. We’re now working in the Asia-Pacific region. Every time, we have done so in making sure we also protect our vital interests, advance the interests of our automobile sector, protect the interests of supply management, advance the interests of Canadian agriculture. Look, there is always a reason to walk away from the table. There is always a reason to be against agreements. These parties here opposed the original Canada-U.S. agreement. They opposed NAFTA. Some of them oppose Europe. But the reality is we have been able to do these agreements, advance the interests of the Canadian economy. We will only sign a deal if it is in the interests of the Canadian economy, but we are going to sit at the table, and we’re going to make sure we’re there and that we advance and defend Canadian interests. Justin Trudeau: Mr. Harper talks about how many deals he’s signed over the past years, what a great job he’s done reaching out around the world, but Canada has the worst rate of export growth – or sorry, the Prime Minister – this Prime Minister has the worst rate of export growth of any prime minister since World War II. So if this is your best efforts, Mr. Harper, we have to worry about what – what will happen if you get reelected because the fact of the matter is Canada needs to engage positively on the world stage, and our diplomacy, our cultural exchanges, our engagement in humanitarian efforts, our climate change responsibilities all feed into how we’re able to engage in the kinds of trade deals that are going to bring good jobs to Canadians, that are going to create a brighter future for people because we know that export intensive industries pay 50 percent higher wages than non-exporting industries. Rudyard Griffiths: Thank you, Mr. Trudeau. Justin Trudeau: This is something we need to do. Rudyard Griffiths: I’m going to quickly go to Mr. Harper to reply and then to Mr. Mulcair. Rt. Hon. Stephen Harper: Well, look, we’re in a sta–, in a decade of global economic instability, we’ve increased our exports 50 percent. Justin Trudeau: All with someone else’s (crosstalk). Rt. Hon. Stephen Harper: We’re not living in a different era. We’re living in an era that has been very difficult, where Canada’s performance in job creation growth is – is the best among the G-7. We need to continue that by taking forward-looking actions. That includes the historic steps we’ve taken to conclude trade deals in this continent, to conclude trade deals in Europe and also work to try and get trade deals in the Asia-Pacific region. And you don’t get those deals by coming up with a million reasons why you’re against them before you even get to the table and why you should walk away once you’re there. We’re there. We’ve had a successful – we’ve had a successful record of making sure we defend the broad interests of the Canadian economy, open up our markets, and that is what we’re going to continue to do. L’Hon. Thomas Mulcair: M. Harper, Marcel Groleau m’a demandé de vous poser la question. C’est le président de l’Union des producteurs agricoles. Lui veut savoir de votre part si vous allez défendre intégralement notre système de gestion de l’offre. Je vous laisse lui répondre. Le très hon. Stephen Harper: M. – M. Mulcair, notre position est claire depuis le début. Dans toutes nos négociations internationales, nous avons toujours défendre le système de gestion de l’offre. Nous continu–, nous continuons ça dans ces négociations. Nous défendons aussi les agriculteurs s’ils sont hors de cet système, et nous défendons les intérêts de tous les secteurs. Et notre engagement est de – est de conclure un accord qui est dans l’intérêt supérieur de toute l’économie canadienne. Rudyard Griffiths: Last word to you, Mr. Trudeau. Justin Trudeau: This election is about how we actually build a stronger and brighter future for us all. Now the Liberal Party has put forward propositions, and you’ve heard about them, on deficits to invest in our communities and our infrastructure. But we also understand that trade and creating good jobs is at the heart of what every Canadian prime minister needs to do. We are too big a country with too few people to be able to do it all on our own. We need trade with the U.S., with countries around the world to actually grow our economy to create good jobs for Canadians. And the fact that Mr. Harper hasn’t been able to get it done on the big files and Mr. Mulcair continues to obstruct and deny the importance of trade means that the choice is clear in this election to pick the Liberal Party of Canada. Rudyard Griffiths: Very brief final interjection by Mr. Mulcair. Hon. Thomas Mulcair: Thank you, Rudyard. The question to ask is who do you want representing Canada at the Climate Change Conference in Paris in December? Who do you want sitting across from Angela Merkel as we do try to get a deal that suits all of our purposes? Who represents Canadian values on all of the issues we’re discussing tonight? For 150 years, we’ve been told we have no choice but to alternate between the sponsorship scandal and the Liberals and the Senate scandal and the Conservatives. (Laughter.) This time around, there’s a real choice of an NDP government — a progressive, forward-looking choice for Canada and for Canadians’ values. All of us here hope that this debate has helped inform the vote that you, the viewing audience, everyone here in this auditorium will cast in three weeks’ time. Let’s be sure, all of us, regardless of our views, our party, to head to the polls to vote. For those of you watching online right now – (applause) – our post-debate panel begins co-hosted by Facebook Canada and The Globe and Mail.